xt:Commerce is developed as a powerful ecommerce webcart shop system for small, medium and full-sized merchants as well as wholesalers. Its full functionality enables you to strengthen your position in the fast growing ecommerce shopping cart market. 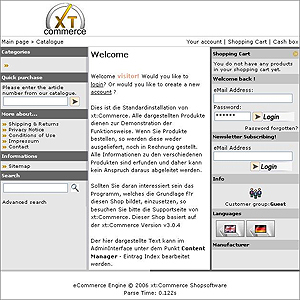 xt:Commerce is released as a free opensource shopping cart software (GNU/GPL) with a broad spectrum of ecommerce functions, as dynamic and powerfull as expensive ecommerce shopping cart systems. xt:Commerce helps you to manage your woldwide ecommerce sales as easy as the online sales in your home country. A shopsoftware system that provides your success just by using this webcart system. It is one of the leading opensource ecommerce shopping cart system available in the market, and has ongoing development to further enhance functionalities.